Edible landscaping is about filling the public realm, such as parks, trails and even planters, with all manner of creative food growing projects. This includes the substitution of ornamental flowers with vegetables, herbs and pollinator friendly flowers. Check out the urban agriculture online map to discover all the ways we are growing urban agriculture in Strathcona County! Broadmoor Lake Park’s Edible Fruit Garden was built as a legacy project in partnership with Shell Canada to coincide with the 2018 Communities in Bloom National Symposium on Parks & Grounds and the National & International Awards Ceremonies. The garden contains a number of fruit shrubs and trees—when the plants are ready, residents can pick the fruit. 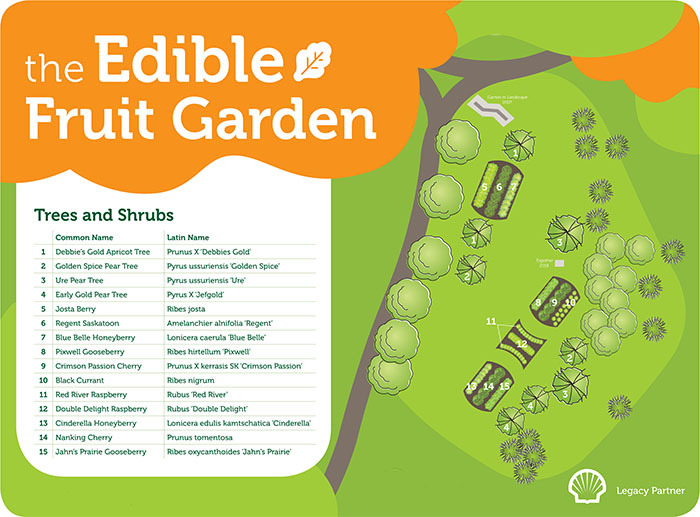 The Edible Fruit Garden also includes a public art installation. Created by Paul Reimer, “Together” includes two hand-forged iron impressionist-style tree sculptures inspired by the Communities in Bloom theme “people, plants and pride . . . growing together”. Vegetables, such as peas, tomatoes, carrots and lettuce, herbs and edible flowers, have been planted in five planters near the spray park entrance at Broadmoor Lake Park. Each planter is unique, with different edible plants! Visit the planters spring, summer and fall to see how the plants are growing. The edible planters are for the you to enjoy. Bring a bag and garden scissors, and help yourself to some of what’s growing. Each planter will have a plant list so you know what’s growing. Where would you like to see planters filled with edible plants? Call us at 780-417-7100 to share your ideas. Find all the ways we are growing urban agriculture in Strathcona County! The urban agriculture online map is an inventory of resident and County-led initiatives that support growing food in public places, such as parks, trails, school yards and in planters. The map highlights food grown by groups, including community and school gardens (where food grown is harvested by members), as well as projects where food grown is for everyone to enjoy. Edible plants that grow naturally in public spaces such as storm ponds and trails are highlighted on the map alongside projects that support pollinator habitat. Currently, the only garden open to everyone to harvest is at Broadmoor Lake. We hope to grow more publicly accessible gardens in the future. Visit the urban agriculture online map. The map will be updated regularly as our inventory of edible plants and landscapes continues to grow. Help us populate the map! 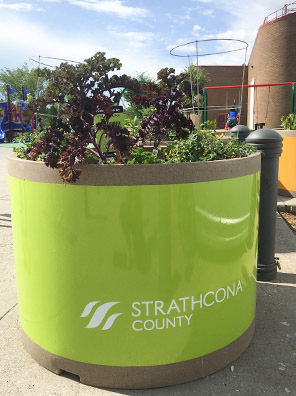 Residents are invited to share locations of edible shrubs and trees throughout urban areas in Strathcona County. Call us at 780-417-7100. 4. If you can't name it, don't eat it! Permanent link to If you can't name it, don't eat it! The information in the edible plants online map is provided as a reference for people with sufficient knowledge of edible berries and plants to learn the locations of known geographic areas that contain them. Many kinds of edible berries and plants grow in the wild and public spaces; however, not everyone will react positively to consuming them. Additionally, some plants and berries may contain chemical residue or pesticides from the environment or soil or as a result of overspray from public or private property. It may be difficult to determine with complete certainty which ones are edible and which are poisonous or toxic as their appearance may be similar. Take preventative precautions to protect yourself, which includes not eating berries and plants that you cannot identify. Note: Your use of this information is solely at your own risk and you are fully responsible for any consequences arising from your use of this information. Strathcona County does not give any warranty or representation as to the accuracy, completeness, currency, or quality of this information. Strathcona County is not liable for any direct, indirect, incidental, consequential, special, or other damages or losses that may result from the access to or use of this information.